I found this recipe online this week and couldn't wait to try it. Oddly enough the weather cooperated by dipping down into the fifties and giving us some grey drizzly days, perfect for my first roast chicken of the season. Arugula is an amazing plant. It germinates easily and grows quickly. What farmer wouldn't like it? The only draw back is that a little goes a long way. The leaves are spicy and I am always on the hunt for recipes that balance that heat, so you don't only taste arugula in the dish you are making. This recipe was a total success. I even caught my husband, Rob, eating the bread salad and arugula mix cold out of the fridge the next day. In this recipe you make a bread salad with raisins and pine nuts, you roast a chicken, and when you take to chicken out of the roasting pan you place the bread salad into the pan juices and roast that while the chicken rests. Sounds yummy, right? Finally, you pull the bread salad out of the oven and toss with the arugula to wilt it. So you get the sweetness of the raisins and roast chicken counter balancing the heat of the arugula and it all comes together wonderfully. This dish is from About.com and was posted by Molly Watson. She adapted it from a the Zuni Cafe in San Francisco where it is a signature dish. So Molly Watson has streamlined Zuni Cafe's dish and I have adapted her recipe. Now its your turn to try it and tweak it where you will. 1. Measure out 1/2 tsp. salt per pound of chicken (i.e. a 4 lb. chicken will need 2 tsp. salt). Rub the salt all over the chicken. Set the chicken breast-side up in a roasting pan and chill at least 2 and up to 36 hours. 2. Bring the chicken to room temperature along with about a tablespoon of butter. Meanwhile, cut the bread into 1/2-inch slices. Brush the slices liberally with olive oil. Grill or broil the bread until grill marked or toasted on both sides. I used the broiler and it only took a minute or so per side. Set the bread aside to cool. 3. Rub the breasts and top of the thighs of the chicken with butter. Pour the wine or broth into the bottom of the pan. Roast the chicken, undisturbed, until browned, about 45 minutes. Check occasionally and add more broth or water if the pan looks dry. 4. Reduce oven temperature to 325 degrees. Continue roasting until the meat pulls away from ends of drumsticks and the thigh joints feel loose and move easily when you wiggle the end of a drumstick, about 30-50 minutes depending on the size of your chicken. 5. Meanwhile cut the toasted bread into bite-sized cubes and set aside in a large bowl. Heat 1 teaspoon of olive oil in a small frying pan over medium high heat. Add the garlic slices and raisins. Cook, stirring, until fragrant, about 1 minute. Add the vinegar, bring to a boil, and drizzle over the bread cubes. Quickly toss everything to combine. 6. Return the frying pan to the heat and toast the pine nuts, about 30 seconds. Add them to the bread and toss to combine. 7. Transfer the chicken to a large cutting board. Put the bread mixture in the roasting pan, tossing to combine the bread with the pan juices from the chicken, and put the bread mixture back in the oven. Let the chicken sit for at least 10 minutes. Cut into serving pieces. 8. Remove the bread mixture from the oven. 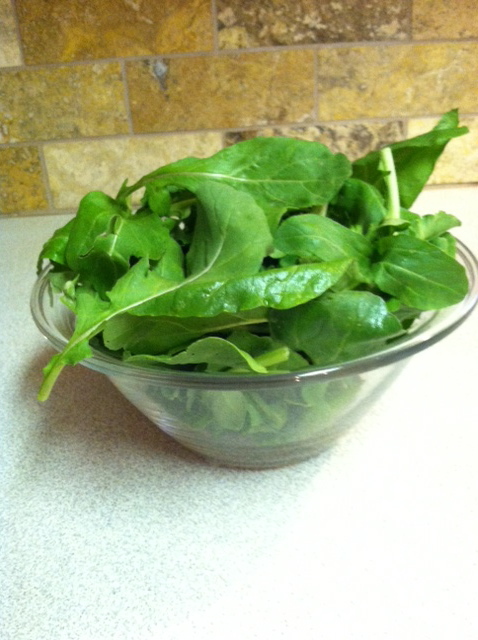 Toss the bread with the arugula until the leaves wilt. Add black pepper to taste. 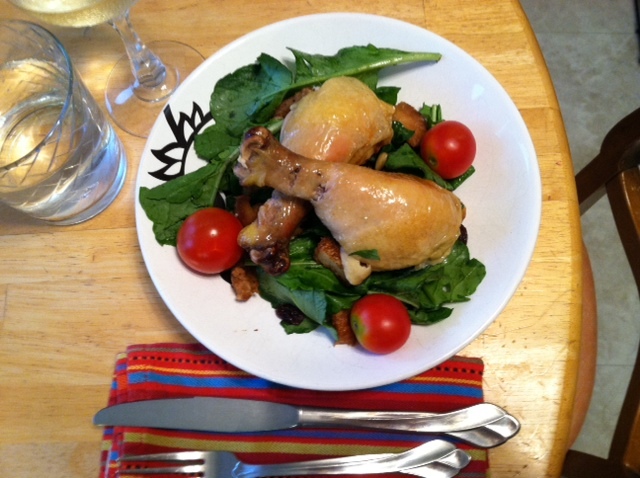 Put the bread salad in a serving dish and serve alongside the roasted chicken. 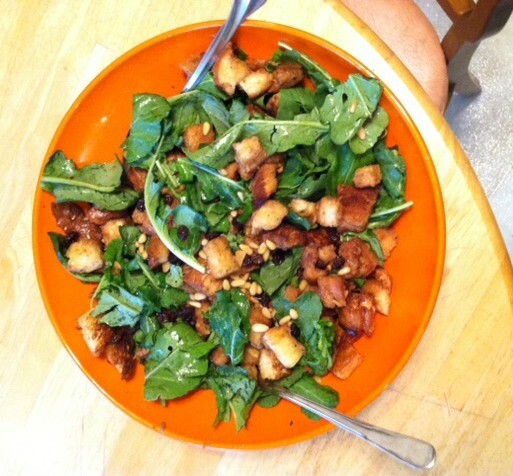 Rob also suggested shredding the chicken and tossing it with the bread and arugula. Enjoy!